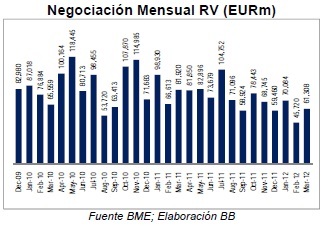 MADRID | Equity trading in Bolsas y Mercados Españoles BME dropped by 25% year on year in March. Total equity volume traded reached €176.935 billion during the first quarter of 2012, which represents a 28.5% fall, too. But analysts at Bankia Bolsa say we should put things in context before letting ourselves go with the flow of hopelessness that has lately surrounded everything economic and Spanish. Where is the key for their optimism? 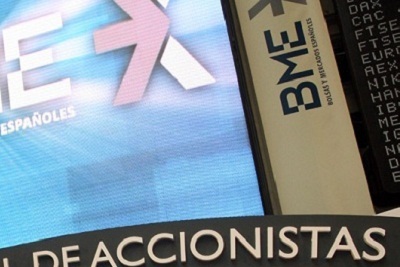 At Bankia, experts remind investors that BME will pay in May dividends from two sources, return on unrestricted reserves and a complementary interest. EU’s Lehman-esque synthetic ETFs: don’t you blame Wall Street again! Be the first to comment on "Ibex35 outperforms Stoxx50 by 1.8% in March"